Difficulty: A long walk, entirely off-road, and, for extended periods, without shade. There is some quite arduous climbing too: the walk contains two ascents and descents of approximately 400 metres, so a degree of stamina is required. Water is available at two points along the walk. 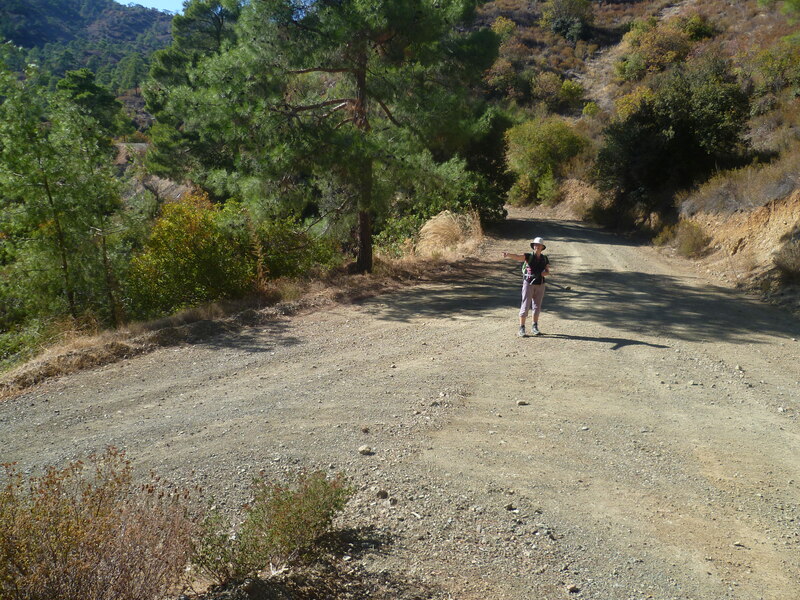 This lovely walk takes you along deserted earth roads and paths to the isolated monastery of Profitis Ilias. There is plenty of climbing and descending, none of it too steep, but fairly arduous nonetheless. The last 5km back to the car can be quite a long haul so make sure you have a nice treat waiting for you there! This walk took us around 8.5 hours including stops for lunch and to admire the views. About 7.5 hours’ actual walking. 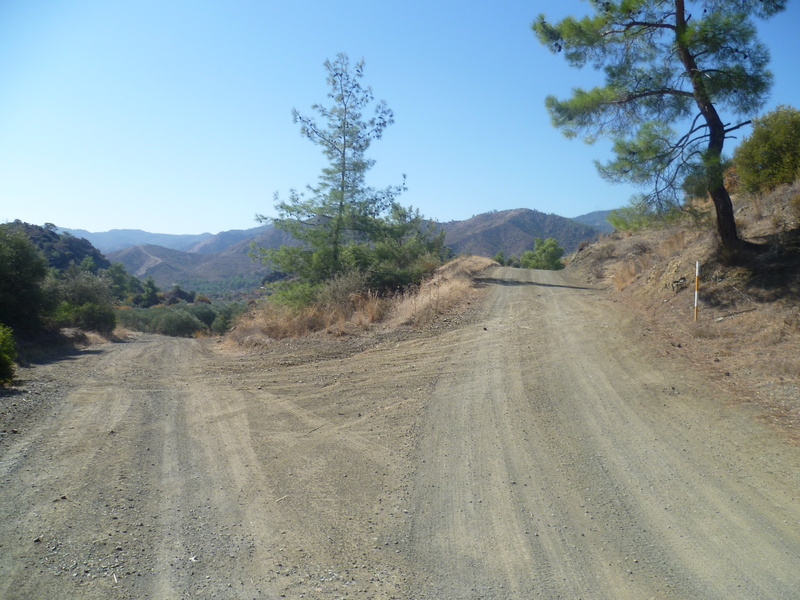 Your starting point is on the road from Pano Lefkara to Vavatsinia. 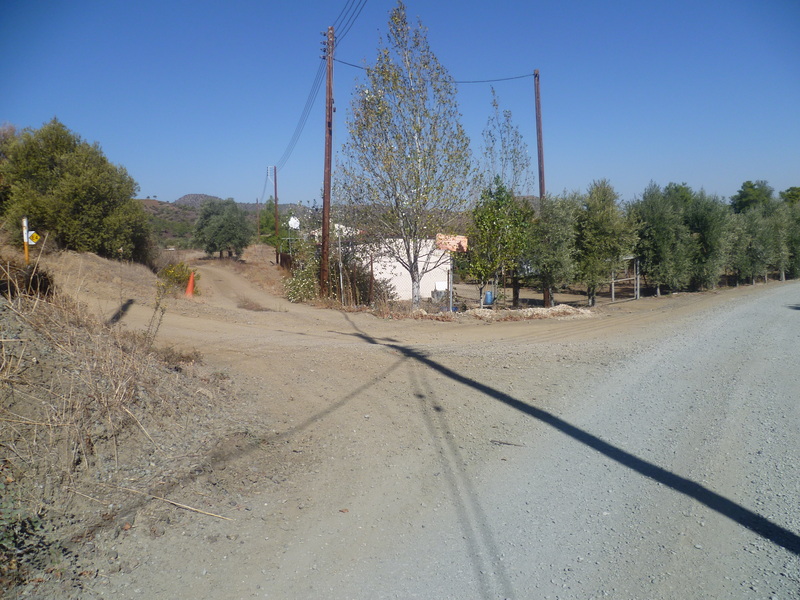 About 7km beyond Pano Lefkara there is a signpost ‘Kyprovasa 5km Lythrodontas 11km’ on the right hand side of the road. Park here and set off downhill toward Kyprovasa on this earthen road. 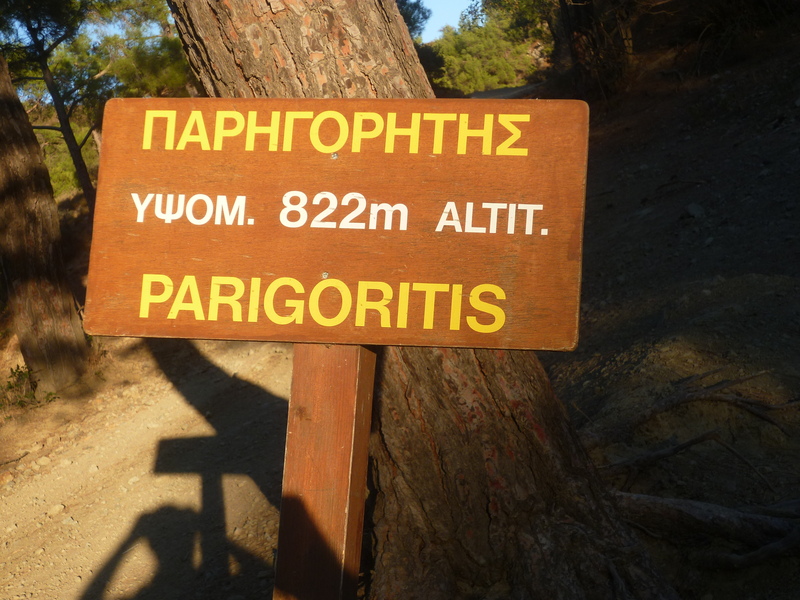 After 5 minutes, ignoring all tracks to left or right, you arrive at a junction with a signboard marking ‘Parigoritis 822m altitude’. Take the right hand track and continue downhill into the valley. Beautiful views swiftly open up across the foothills and down to the southern coast. Keep following the clear earthen road downhill. After 1 hour 5 minutes you will walk past an old house (it used to be a goat farm) on your right. You should also be able to glimpse the Lefkara reservoir (assuming it’s reasonably full) in the valley to your right at around this time. …before swiftly arriving at a three-way junction. 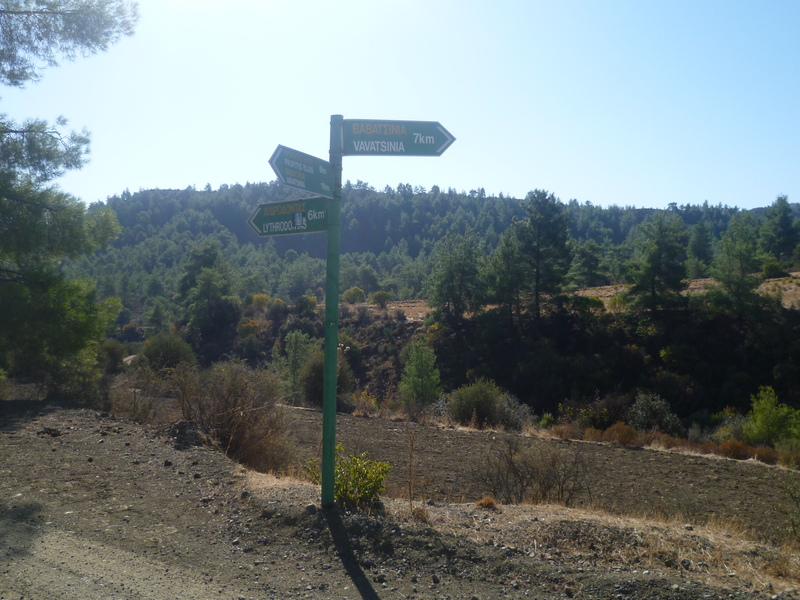 The signpost there points back to Vavatsinia, left to Vavatsinia and Profitis Ilias and straight on to Lythrodontras. Take the Lythrodontras road ahead. 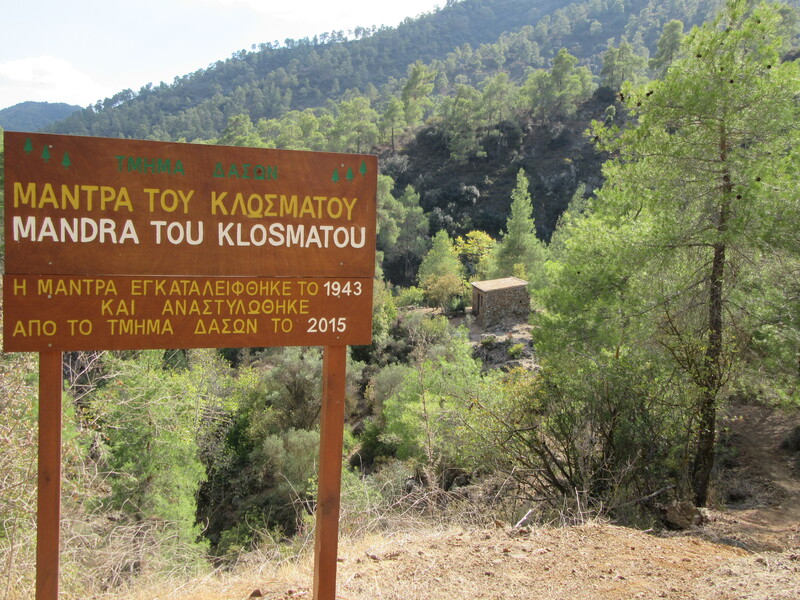 You are now walking through an irrigated olive grove on the valley bed and in a couple of minutes you will pass a ruined farmhouse on your left where there is a signboard marking ‘Kyprovasa 413 metres’. 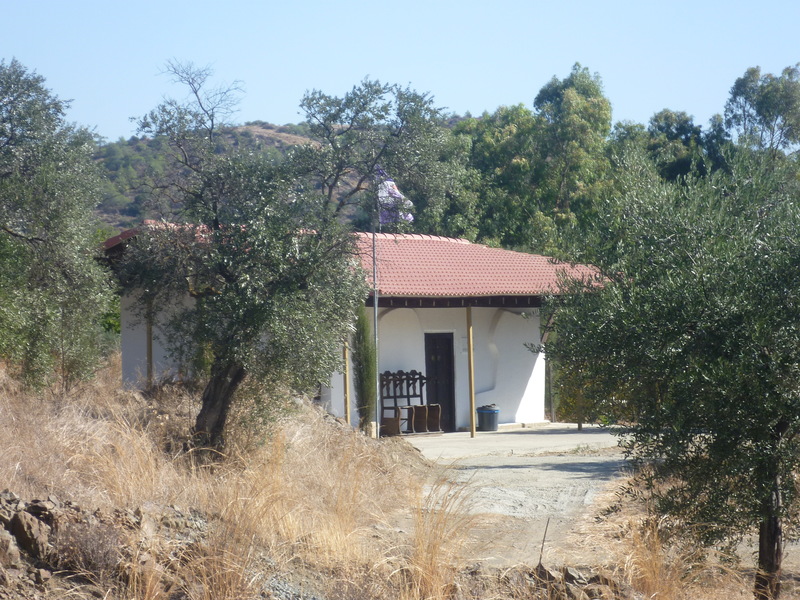 At 1 hour 30 minutes, as you turn a bend in the road, the large white modern monastery of Agios Demetrios will come into view on the top of a hill in the distance ahead. At 1 hour 40 minutes you will cross a stream with a signboard ‘Dhiplopotama 411metres’. Keep following the main track as it starts to gently climb away from the stream, ignoring any tracks to right or left.The gravel track eventually becomes an (intermittent) low-grade concrete road as it rises out of the valley. 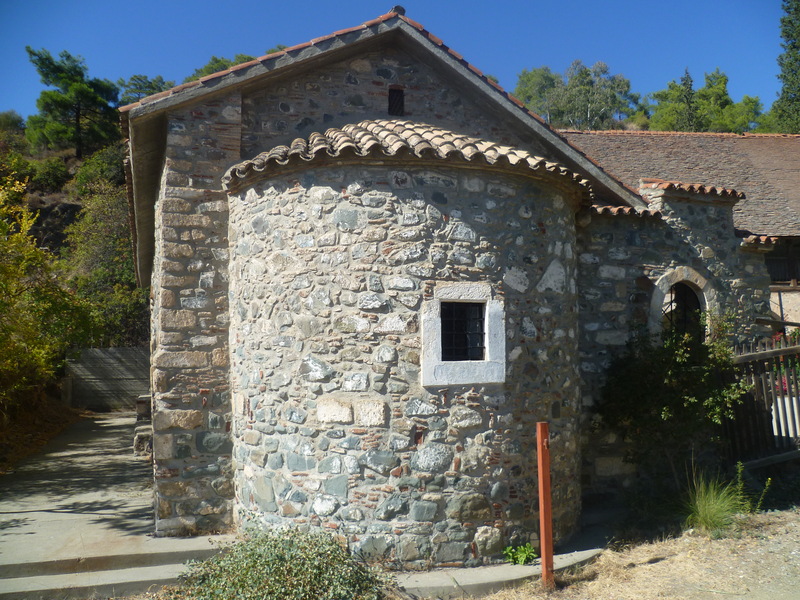 At 1 hour 55 minutes you will pass the small church of Agios Georgios to the right of the road. There are some cool shady benches here and this is a good place to catch your breath. Look out for the E4 signs and take care that you follow the correct path. About 5 minutes after you join the E4 you will come to a fork: follow the E4 sign to the left. A couple of minutes later, at another E4 sign take the right fork (compass direction WSW) which climbs along the side of the hill. 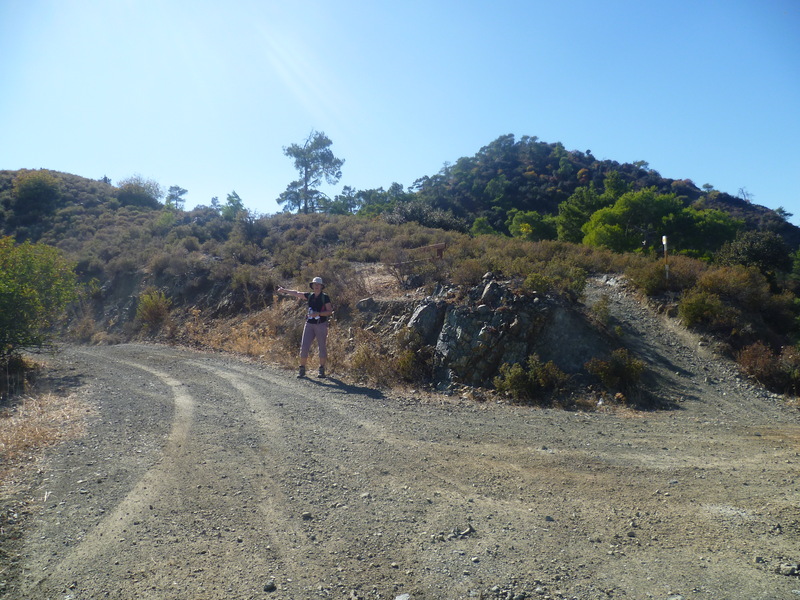 The route is generally fairly easy to follow along the E4 which takes you all the way to Profitis Ilias. As you climb, take a look around at the views of the north coast, Nicosia and the Pentadaktylos mountain range. 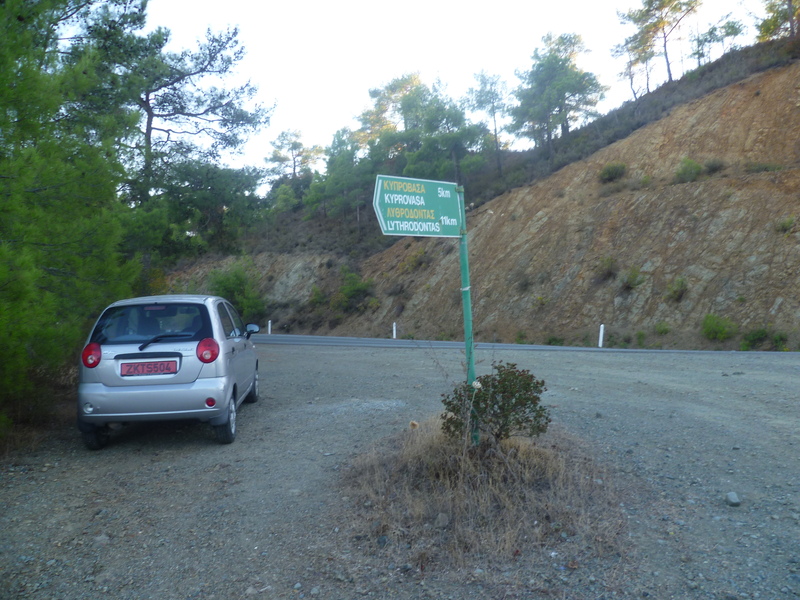 You will see the Agios Demetrios monastery at several points along this walk and it is a useful orientation point, so keep it in mind. You are now walking away from habitation and into quiet forest areas and hills. The walk really starts to feel beautifully remote at this point. 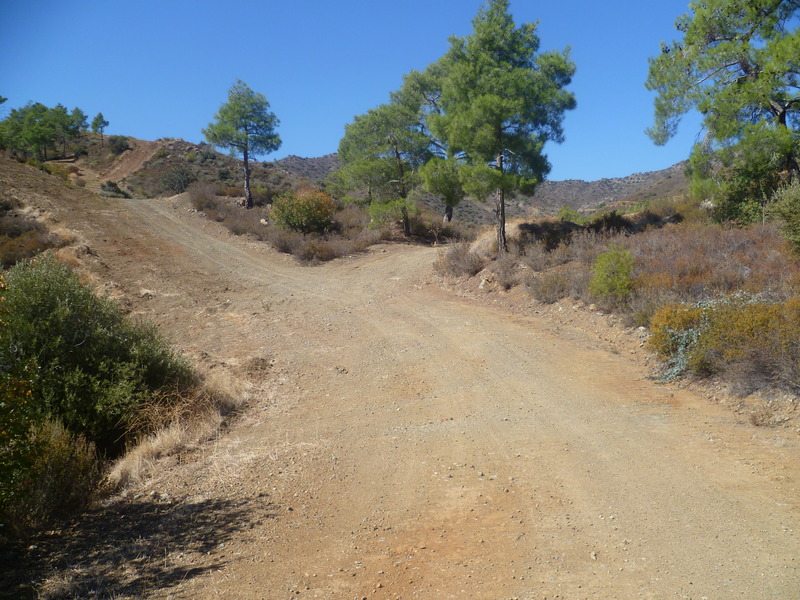 After 3 hours you will reach a fork in the road where there are a few pine trees. The E4 sign was missing last time we did this walk. You need to take the right hand track (in the picture below) which climbs for five metres to a hump then drops back down. From the top of the hump you can catch a glimpse of Profitis Ilias monastery up ahead of you in the distance. The next E4 sign is some 12 minutes later at another junction where you take the right hand track (as below). You are walking through beautiful and deserted open pine forest and scrub-land. Expect to see plenty of birds around here including masked shrikes and black headed buntings in the spring. We even disturbed a nightjar here from its daytime resting place. Continue to climb on the main track and ignore any side tracks. 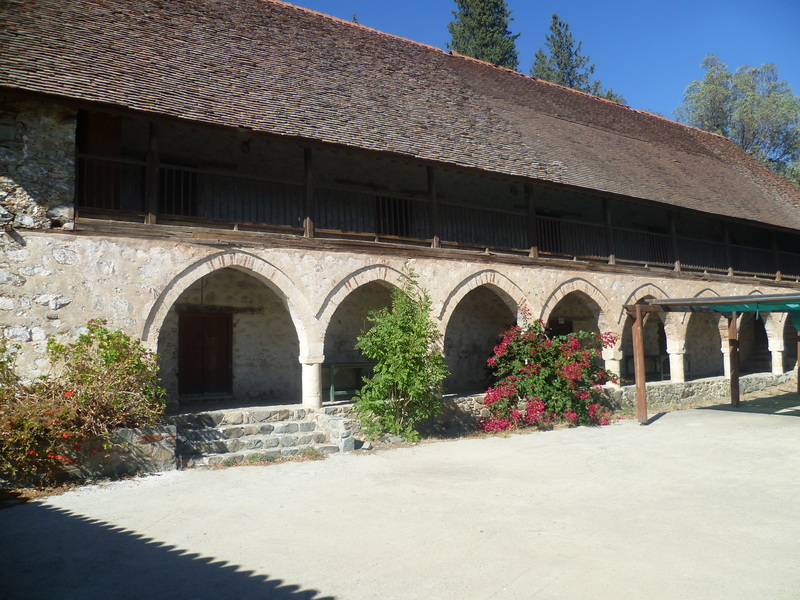 At about 3 hours 20 minutes you will get a clearer view of Profitis Ilias monastery to your right. 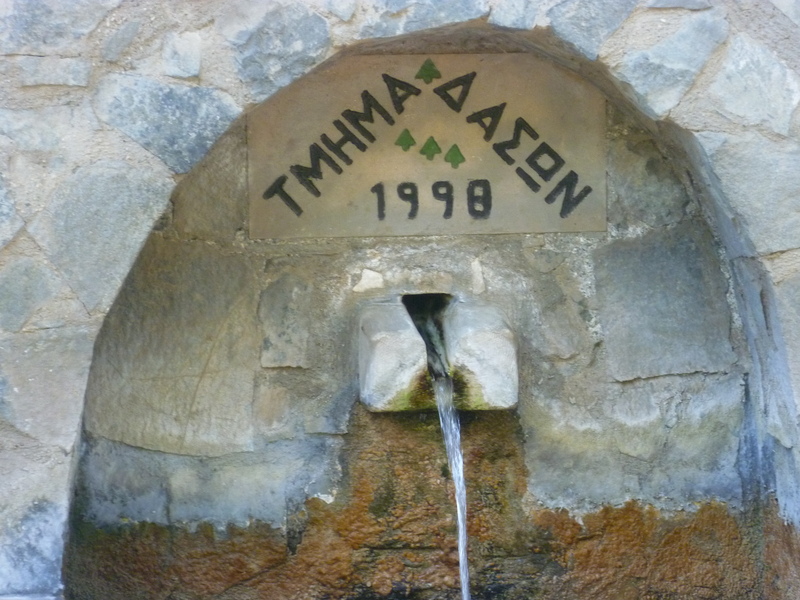 …and, after around 3 hours 45 minutes walking, reach the monastery of Profitis Ilias (Altitude 683 metres). 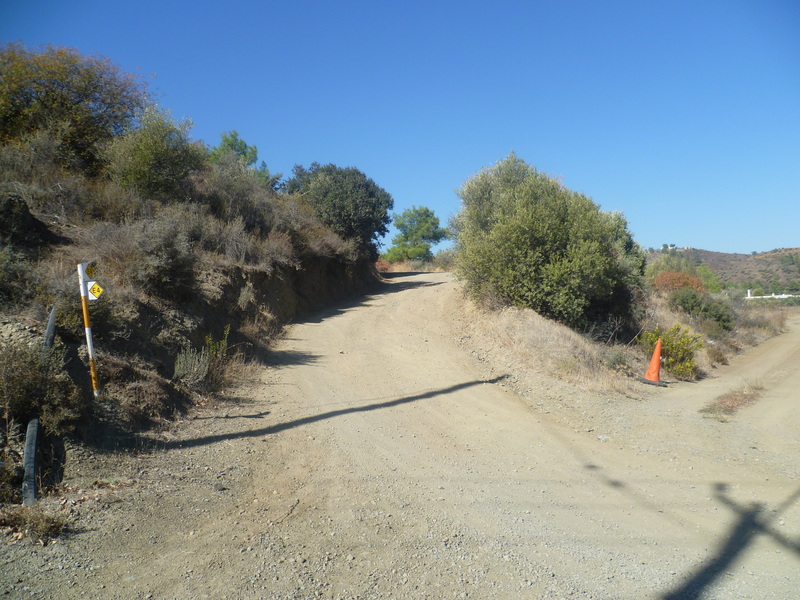 Note that the E4 path heads to the left and up the hill just before the monastery gates – this will be your onward path after you have explored Profitis Ilias. This is a beautiful place with plenty of shady spots for a picnic. There are toilets, a picnic area with tables and barbecues. Also drinking water (sometimes!) from the tap to your left just before you enter through the main gates. There appear to be some facilities for overnight stays. A kitchen and some bedrooms were locked, but there was an open bedroom with a few battered bunk beds and also a bathroom (very dirty). If you were really stuck you could shelter here overnight, but we wouldn’t recommend it as a place for a comfortable night’s sleep. After you have explored the monastery, eaten lunch and refilled your water bottles, return to the E4 path that you passed earlier. 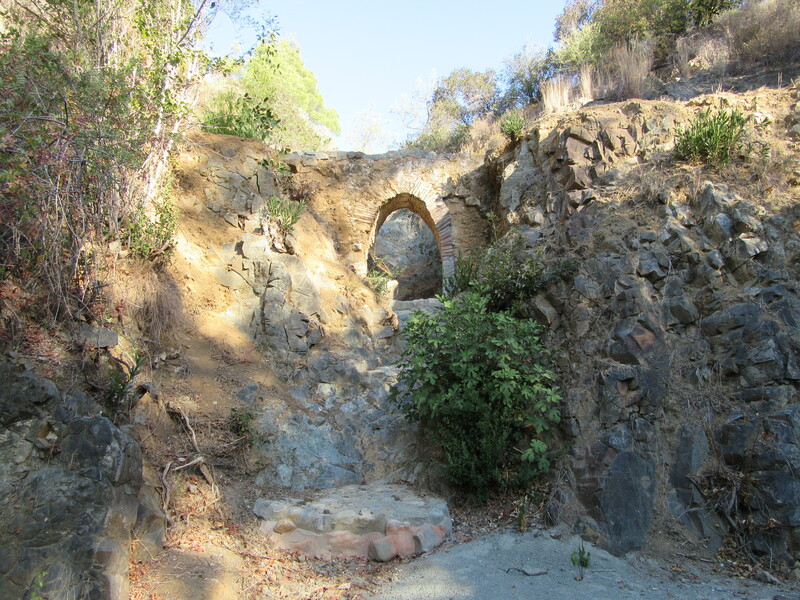 Climb up the path as it winds behind the monastery and uphill. After about 4 hours 5 minutes (timings from now on ignore the lunch stop) you arrive at a junction. There is a signboard to ‘Throni 750m’ pointing right and the E4 is signed to the left up the hill ahead. Follow the E4 for a few more metres and you will arrive at the junction pictured below. You are going to leave the E4 here and you should head along the earth track to the left, passing a wooden bench to your right. Jane is pointing the way in this photo. Follow this track as it winds around the contours of the hill – taking in the great views across the hills to the north east – then gently descends. At 4 hours 25 minutes you will pass a track leading to your left. IGNORE THIS and continue for a further six or seven minutes, taking the path at this point which doglegs back downhill to your left as indicated in the picture below. You will be heading in a generally south-easterly direction all the way back to Kyprovasa, so keep this in mind. Keep following the path downhill and at 4 hours 45 minutes you will pass a helicopter pad on your left just as you reach a junction where a green signpost indicates ‘Lythrodontas 9.5km Vavatsinia 8.5km’. Take the track to Vavatsinia (the first dogleg right, heading downhill) and in another ten minutes (4 hours 55 minutes) you will arrive at a spring: ‘Kakarmata Vrisi tou Petri 670m’. 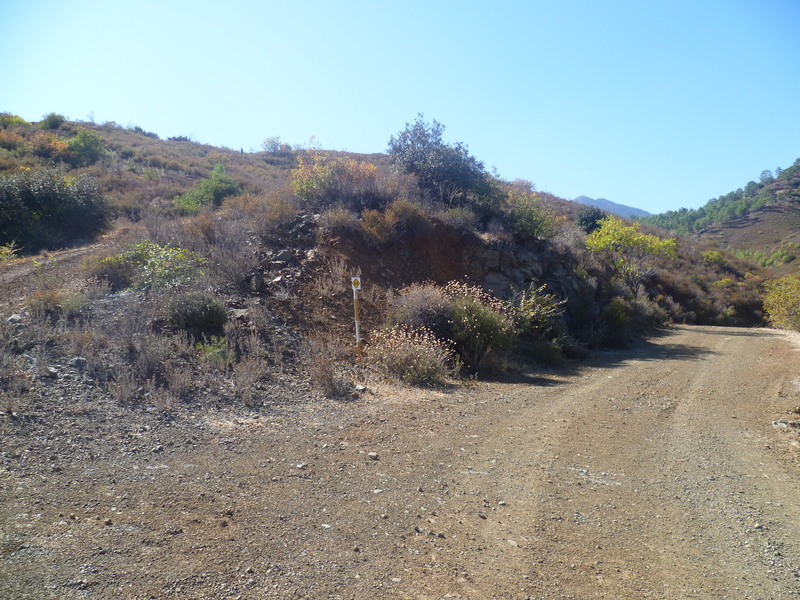 A signpost here indicates ‘Kyprovasa 5km Vavatsinia 6km and Profitis Ilias 3km’. Follow the track back to Kyprovasa. This is one of the loveliest parts of the walk through a deep, forested gorge, plunging down to the stream on your right while cliffs tower above you on both sides of the valley.There are a few minor paths off to your left and right but ignore these and keep the valley bed to your right – you can’t really go wrong. 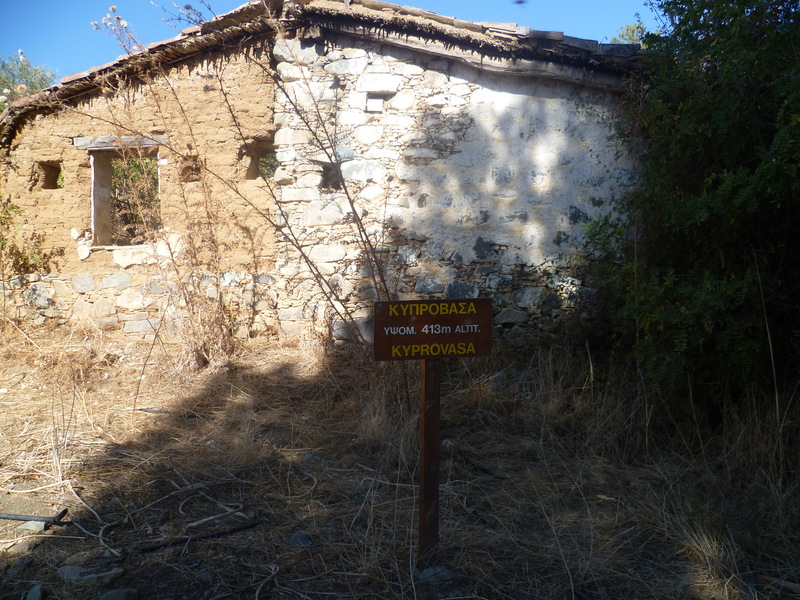 Make a point, too, of stopping along the way to look at the recently reconstructed peasant cottage in the valley bed at Mandra tou Klosmatou. After 6 hours 5 minutes walking you will be back at the three-way junction at Kyprovasa. 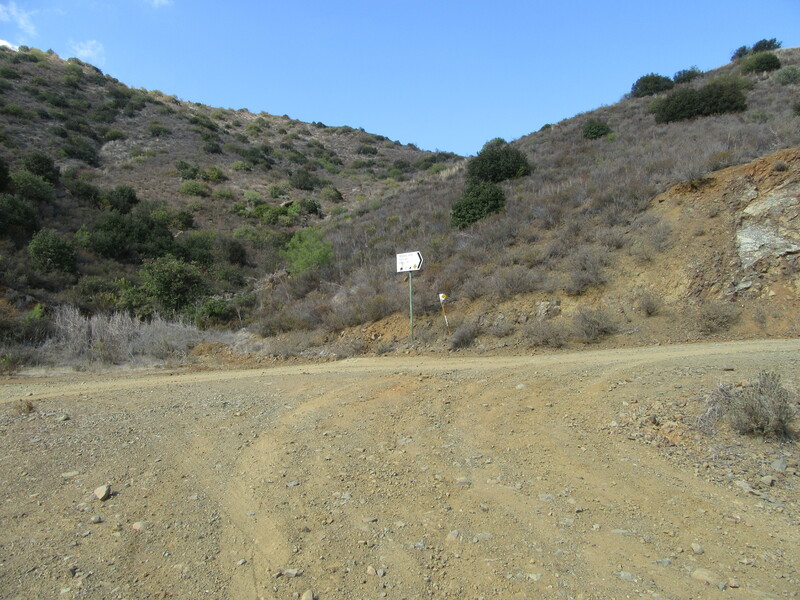 Take the right hand road, crossing the stream bed and retracing your steps for the long climb up the hill and back to your car. This last section is – we think – the most physically and mentally challenging part of the walk but if you are as fit as you think (!) then you should arrive back after around 7 hours 30 minutes walking (not forgetting to add a lunch stop to this timing).